Blogging and Websites – Learn Picasa and Google Photos! There are lots of posts on Picasa’s official support forum from people upset that the “Blog This!” feature of Picasa is no longer working. That doesn’t bother me at all. 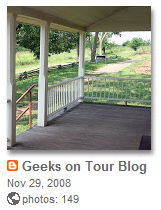 Even though I’ve kept a Blogger.com blog since 2003, and used Picasa for almost as long, I’ve never used the BlogThis! 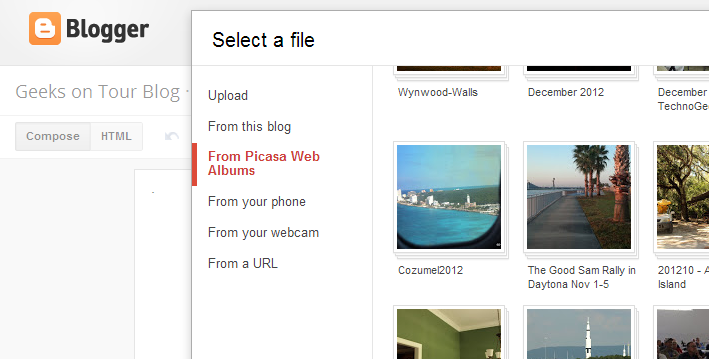 feature to get my pictures from Picasa to Blogger. When you do it this way, you are very aware that your picture is coming from your web album. 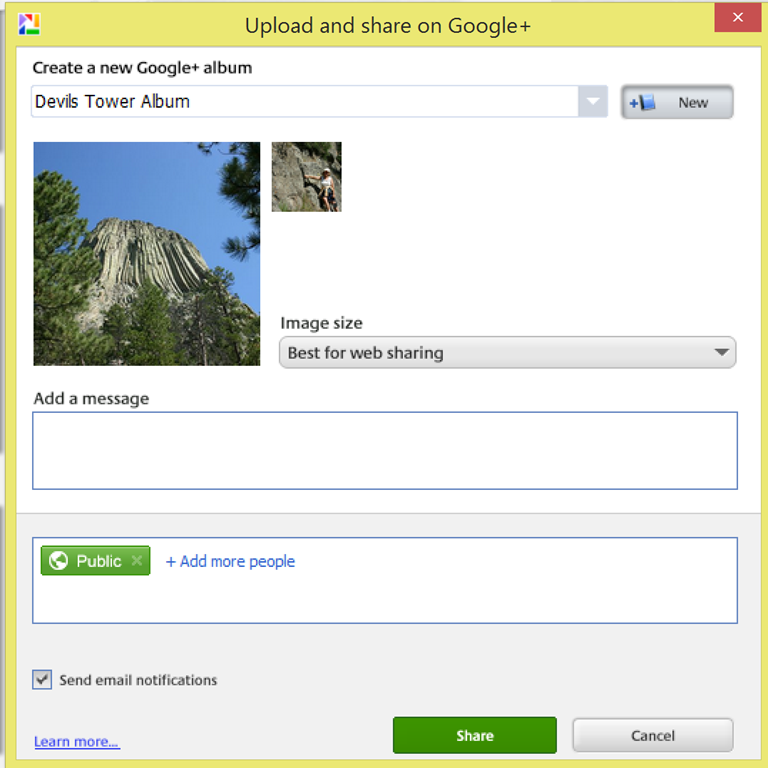 So, maybe you won’t make the mistake of deleting that album from Google Plus. Many people don’t realize that their Blogger pictures are actually stored in your Picasa Web Albums (now Google Plus Photo Albums.) If you used the BlogThis! button (when it used to work) your pictures were stored in a Web Album named the same as your Blog. 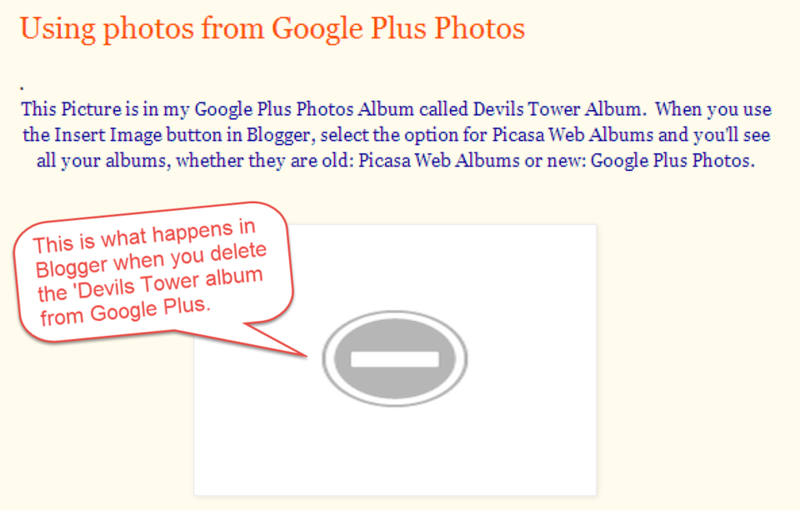 If you delete (or even rename) that album from Google Plus Photo Albums, you have deleted the picture that was showing in your Blog. Sometimes I’m not interested in scrolling thru all the text on my Blog, I just want to look at all the pictures I took. In our RVing lifestyle, we’re taking pictures all the time, so I upload the best ones into albums by month. Sometimes a special event like ‘Cruise to Alaska’ deserves an album all its own, but normally I have an album for each month. In a month where we traveled a lot, I might have 1-200 pictures, like last September when we started the month in Nevada and ended in Florida. If you click the link you will see all my pictures for that month. 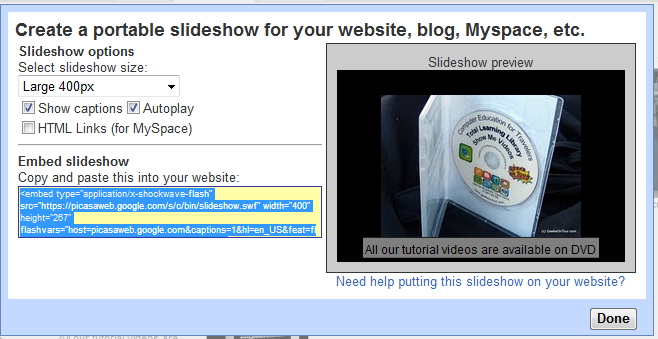 You can even click on one picture to see it full screen, then click on the option for Slide Show. Some friends might not want to read all the text in your Blog, but they love browsing thru your pictures. In that same month – September 2013, I wrote 6 blog posts and used 68 of the pictures from the Web Album. So, I have my choice of just looking at pictures: 157 pictures in the September 2013 Web Album; OR reading the Blog posts that include 68 of those exact same pictures. Beware Picasa Web Albums and Blogger! If you use Blogger.com for creating your blog, and you upload photos from your computer – that creates a Picasa Web Album. 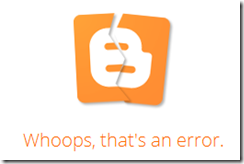 DO NOT delete that web album with the orange Blogger logo! People have made this mistake. They’ve been browsing their Picasa Web Albums and see an album they don’t remember creating. Thinking it was time to clean up, they deleted the album. Next time they took a look at their blog, they saw lots of red x’s where the pictures should be. There’s no way to get the pictures back! Even if you know what pictures they were, and you re-upload them to a web album using Picasa on your computer – they will be in a different location, a different URL than the original album. 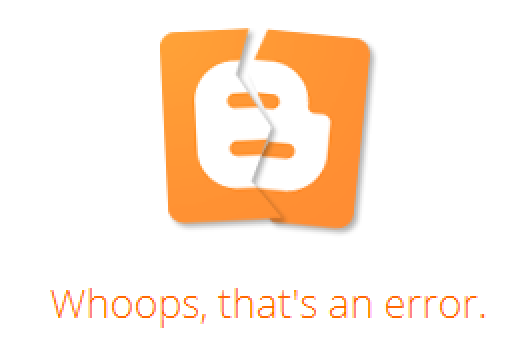 That means that the references to the pictures in your blog will not be correct. You would need to edit each post and re-insert the images from the new Web Album. Using Picasa on my computer, I select the best pictures and Share them online. They are now located in a Picasa Web Album / Google+ Photos Album (see this post for PWA vs G+) in an album which I named. Using this method, I don’t even get the little orange Blogger logo to alert me that there are pictures being used in my Blog. 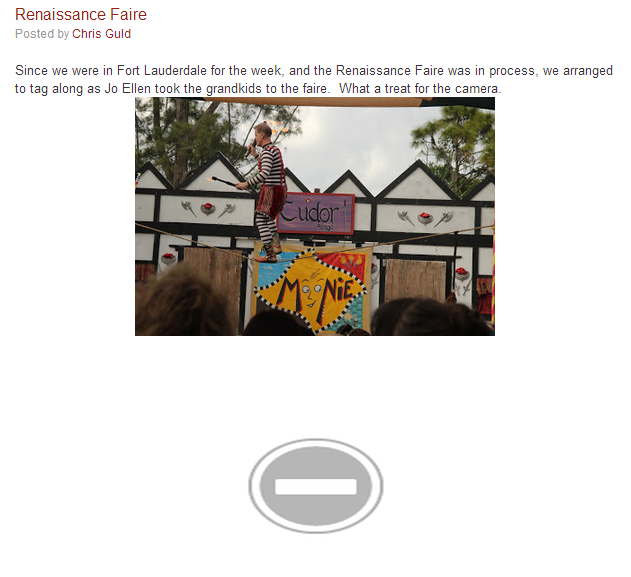 I just tested this and deleted a photo from my Renaissance Faire Web Album that I knew was being used in a blog post. I got NO WARNING! I thought for sure I would see “This photo is used in a Blogger Blog post, are you sure you want to delete?” In fact, I could swear I’ve seen a message like that in the past. Either they’ve changed it … or I’m dreaming, because it deleted the picture quick as could be without so much as a how do you do! When I went to the blog post where the picture was used, here is what I saw. A gray oval with a white dash where the picture should have been. To fix it, I had to re-share the photo from my computer to the Renaissance Faire Web Album, then edit the blog post and re-insert it. The only way to prevent this is to never delete photos from your web albums! It’s that simple – just Don’t Delete! I hope none of you have to learn this the hard way. I expect better from Google. 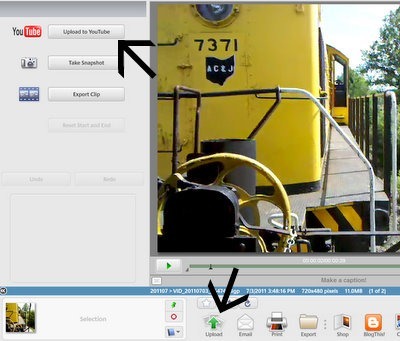 If your camera has the capability of taking video, you’ve probably noticed that they come right into your computer and show up in Picasa when you ‘Import’ from your camera. If you don’t see them, try looking at your options in Picasa: Tools | Options | File Types – and make sure the box is checked next to Movies (.AVI, .MPG, .ASF, .WMV) and perhaps Quicktime Movies too if your camera uses .MOV format. So, now that they’re on your computer, how do you share them? If you double-click on your video Picasa will play it for you and display some special options at the left, including the ability to upload to Youtube. I use this a lot, I like Youtube. But, what if you don’t want to start a Youtube account? Or, you don’t like how public Youtube videos are? The ‘Upload’ button at the bottom works just as well for videos as it does for pictures. 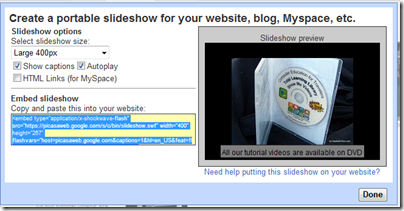 You can upload videos to any Picasa Web Album. Here is that little train video in my Web Album. Once it’s there, you can also add it to your blog posts, just like you add pictures. If you want to see a sample of how it turns out, take a look at this blog post of mine – the train video is embedded about halfway down. You’ll notice that it says it’s hosted by Google Video, and it works just fine – as long as you have a good, fast Internet connection.